Have you seen Kai Martin’s resume as of recent? It’s glowing! 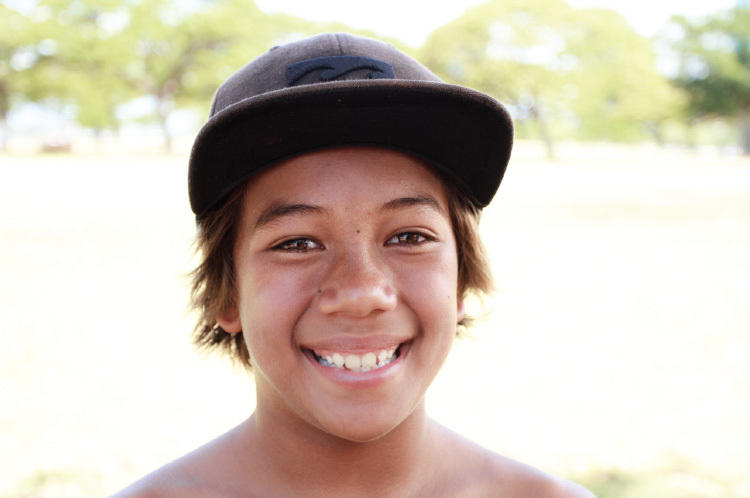 Listen to stellar performances the 11-year-old has achieved in the Mini Grom bracket this year: 1st at NSSA Hawaii Regionals at Kewalos, 1st at NSSA Lahaina Harbor, 1st at NSSA Banyan’s, 1st at HSA Kewalos, and another first place at the Local Motion Surf Into Summer. But if you hang out with Kai, otherwise known as “Kaiboy”, his dazzling results aren’t on the tip of his tongue. Instead, the Honolulu native will talk about adventures. Like that one time he swam across the Ala Moana channel because he was dared to. Or pranks he’s been up to with fellow groms in crowded lineups. So if you see Kaiboy in the lineup this summer, feel free to give the lad a pat on the back, but also keep a watchful eye. You could very well be yet another surfer that gets scared out of the lineup by his own grom prank. What’s your first surfing memory, Kai? The Haleiwa Menehune Gromfest! I was two, and I remember going with my Dad. I had floats on, I didn’t even know how to swim. We sat inside catching whitewater. I remember being happy. After that, how did it evolve into you competing? I started with skating, and got more into surfing and started doing both. How does skating incorporate with your surfing? It helps with the aerial maneuvers and stuff. What about your surfing goals? Hopefully make it on WCT and do well. Maybe even win a competition. Andy Irons, Clay Marzo, Kelly Slater, Taj Burrow. Who are your favorite surfers that are your age? Billabong, Makani Shapes, Town and Country, DVS Shoes. Which shaper do you work with? I’ve been riding Makani McDonald’s boards since day one and they’ve helped me get to where I am today. Mahalo uncle for all your support and for shaping me the sickest performance short boards and longboards. Any pranks that you’ve been up to lately? One time I was at Sports Authority with Brodi [Sale] and there were these golf mannequins so we pretended to be one. Somebody would walk past and we would jump out at them. This one old grandpa almost had a heart attack! Also there’s been pranks with sharks and stuff. A year ago I was surfing and I got a friend to yell shark and I dove deep to make it seem like I was getting dragged down and my board tombstoned. My friend said everyone in the lineup was looking around, getting so scared. I mean I was underwater but he said it was funny. What is your favorite thing about being a grom? If you’re nice to people, sometimes they treat you nice too and they give you waves. Writing, because I get to write about surfing. What do you do for fun in Town? Skateboard! There’s a couple sick spots around here. Also fishing and diving. Any thoughts on a weapon of choice if Oahu turned into a zombie apocalypse? A bazooka! Because it kills a lot of zombies at one time.